Jan is one of those people who just doesn’t take no for an answer, even when it comes from a health care provider. Her persistence and assertiveness have served her well, particularly given the added challenges she’s faced all of her life. Jan has spina bifida. In the first few weeks of development in utero, cells form a tube that becomes the spinal cord and vertebral column. In Jan’s case, this tube failed to close completely at the base of her neck. That opening was surgically closed early in her life, but the altered function of her nervous system persisted and has impacted the function of her muscles. Some muscles are more active (spastic) than typical, while others are weak. It took Jan longer to develop basic movement abilities than it does for most children. She didn’t walk until she was 5 years old, and that was with the help of leg braces. Eventually, she learned to walk without them. When Jan was finishing high school and wanted to go to college, people told her no, she couldn’t. But she did it anyway, and now she works as an academic interventionist teaching primary school children. In 1997 when she needed surgery to free up scar tissue around her spinal cord (tethered cord syndrome, a common complication of spina bifida), she was told she would never walk again without assistive devices like a walker. Jan didn’t take no for answer then, either. Jan persisted. Traditional rehabilitation with physical therapists helped to a point. Jan added in other approaches as best she could. In 2007, she found a personal trainer who would work with her. Pool exercises, assisted horseback riding sessions, and chiropractic and osteopathic manipulations were also parts of her routine. By the end of the year, Jan was walking indoors without her walker. By spring of 2008, she felt she had reached a plateau. Jan was familiar with the clinical services at Des Moines University, and learned about the gait analysis offered in the Human Performance Laboratory by my colleague and biomechanist, Vassilios Vardaxis. Jan contacted Dr. Vardaxis, who contacted me and others in the Doctor of Physical Therapy Program. Because little is known about the gait of adults with spina bifida (most become users of wheelchairs), we decided to approach this as a research case study. 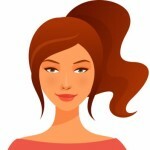 We would do the gait analysis, balance testing, and some other clinical assessments; examine the findings; and then determine our recommendations, if any, for how Jan might modify her program. If we suggested an intervention, we would periodically re-evaluate Jan to assess the effect of the intervention. With Jan’s consent, we proceeded with the initial testing. Gait analysis provides an enormous amount of descriptive information. Although experienced clinicians and practitioners are quite skillful at observing in real time and picking up on many of the characteristics of how people walk, current technology greatly expands on what can be seen. Details about muscle activation patterns, forces as the foot hits the ground, angles at joints, spatial and timing relationships between different body parts, sources of power (what parts help propel or slow you down), and more become apparent with the aid of special cameras, electromyography (EMG), and force plates. 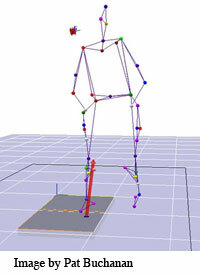 The following 3 figures illustrate some of the gait analysis process. Figure 1. 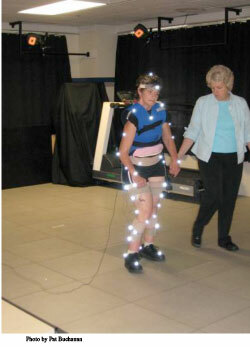 Researchers make final preparations to the reflective markers that show body position and EMG electrodes (with attached wires connecting to the white unit on her back) that pick up electrical activity of the leg muscles. Figure 2. Jan walks in the Des Moines University Human Performance Laboratory. Her left foot is stepping on plates that record the forces that result when she contacts these fancy scales. In the background are the red lights surrounding 2 of the 8 cameras that track the reflections from the markers. Figure 3. The software that is part of the Motion Analysis system allows rapid processing of the raw data. One result is a figure like this one based on the positions of the reflective markers. The red arrow represents the size and direction of the ground reaction force, which is opposite to the force that Jan applied to the plate. After the research team evaluated all of the data from Jan’s testing, we agreed that we wanted to try to improve her walking strategy and reduce her risk of falls. Jan walked stiffly, tended to drag her right toe, and kept parts of herself locked together (sort of like a gunslinger in an old western movie). We wanted to help Jan learn to differentiate her movements, use more trunk rotation, involve her legs more effectively, and also improve her balance. A colleague suggested and we all agreed that I should do a series of Feldenkrais Method® lessons with Jan.
From August through December, Jan and I met for lessons about twice a week. After a break for the end-of-the-year holidays and a foot surgery (another common complication), we resumed weekly lessons in late February this year. She’s had nearly 40 lessons now, and we’re about to wrap up. What kind of lessons have we done? All kinds, of course. We’ve done lessons lying down, sitting, and standing. We’ve done lessons about turning, finding middle, reaching, breathing, using the eyes, and making C curves with the spine. We’ve done lessons about sensing small parts like individual toes, noting her position, feeling muscle activity vs. relaxation, and recognizing the absence of pain (very important when pain has been nearly constant). Jan also has her home program—her tool kit of mini Awareness Through Movement® lessons. They are on flash cards, naturally, befitting the elementary school teacher! Has change happened? Jan and I think so. Some of the data supports us. The data also illustrates what many Feldenkrais® teachers and students know: change is not a linear process. Sometimes as clients discover new, nonhabitual ways to move, behavior is more variable and unstable. As the unfamiliar becomes more familiar, actions become more reliable. There was a period late last year when Jan seemed to be walking “better” (more differentiated), but she was also falling more. Not what we wanted! More recently, Jan is walking much more smoothly, is not dragging her right toe (“I’m not wearing out my shoes anymore,” she reported), and making better use of her legs. We’ll see if the latest rounds of gait analysis and our follow-up testing after lessons end confirm our observations. As often happens in research studies, there are also apparent changes that we haven’t been formally testing. We do have them on videotape, though! For example, when Jan started her lessons, moving between sitting and lying down, and rolling were very stiff and slow actions. Now, Jan is much more fluid and “lazy” in these motions. She loves to roll all the way over on the big mat table we have in the clinic (she’s doing this on the floor now with the help of her personal trainer). I remember early on in our lessons when I asked Jan to lie on her front. That was difficult enough, but then I asked her to come up on her elbows. A bigger challenge. Could she come onto her elbows and knees? No way. We hadn’t worked on this movement, but just recently, Jan decided to try it again. She rolled a few times, paused on her belly, came up on her elbows, and continued onto her fists (her spasticity limits her hand movements) and knees! I posed one more challenge to wrap up our lesson: find an easy way to sit on the side of mat table. Without any verbal guidance, Jan elegantly moved into side sitting, pivoted onto the edge of the table, and sat upright with a satisfied smile on her face. She walked out of the clinic and out to her friend’s truck without using her walker (he left her walker there). That’s learning, the Feldenkrais way.